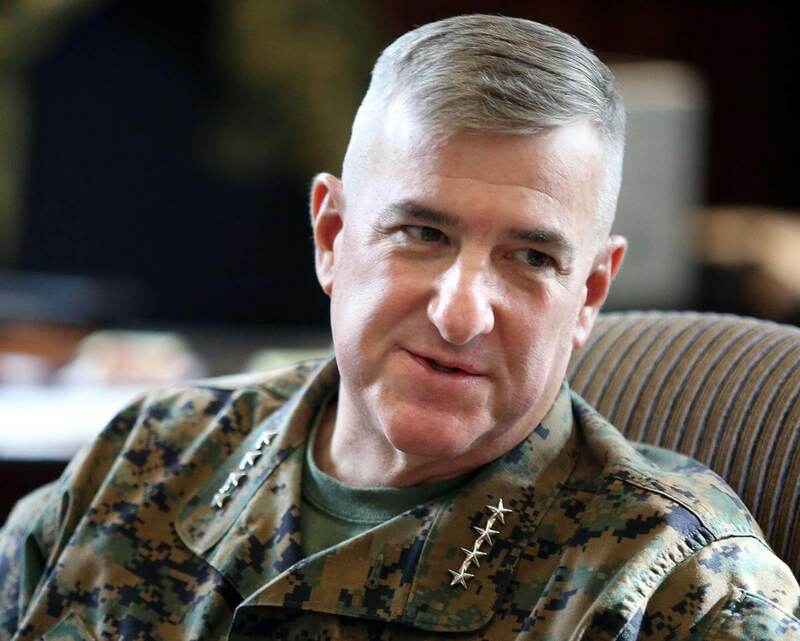 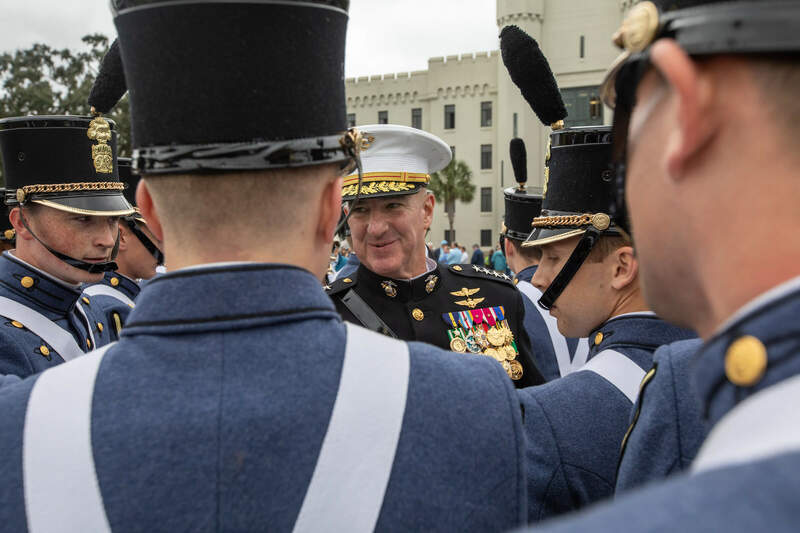 Retired Gen. Glenn Walters, USMC, ’79, assumed his responsibilities as the 20th president of The Citadel on October 8, 2018. 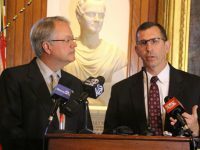 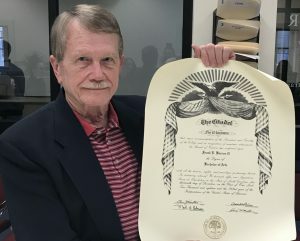 The first 100 days of the Walters administration have been marked by busy introductions, reacquaintances and new beginnings. 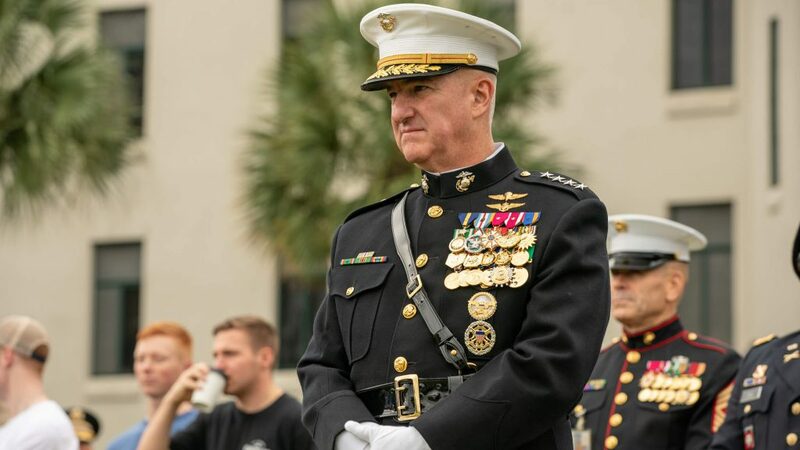 Here’s a look back at some of our favorite moments since the General arrived. 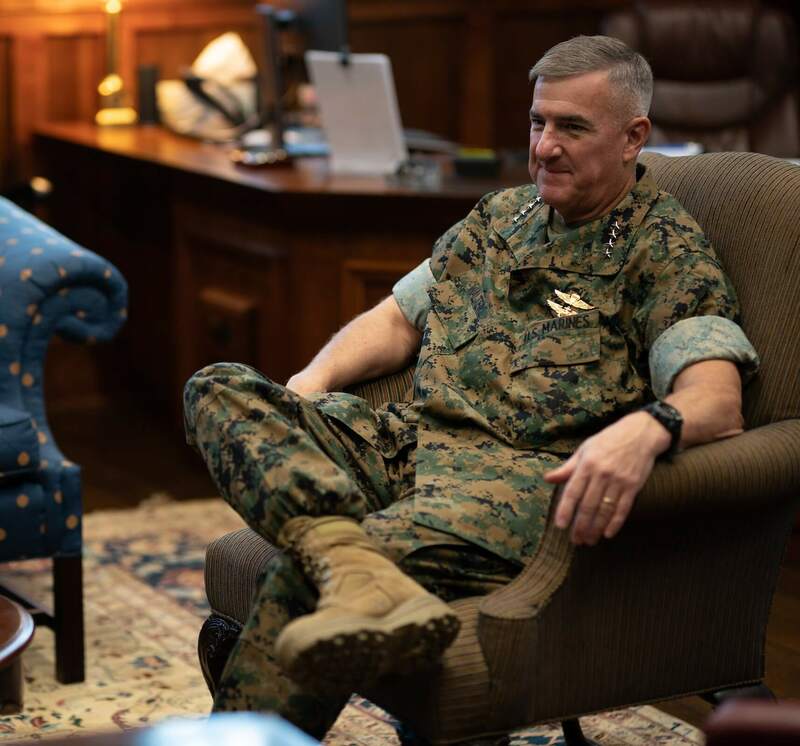 General Walters at his desk during his first official day in the office on October 8, 2018. 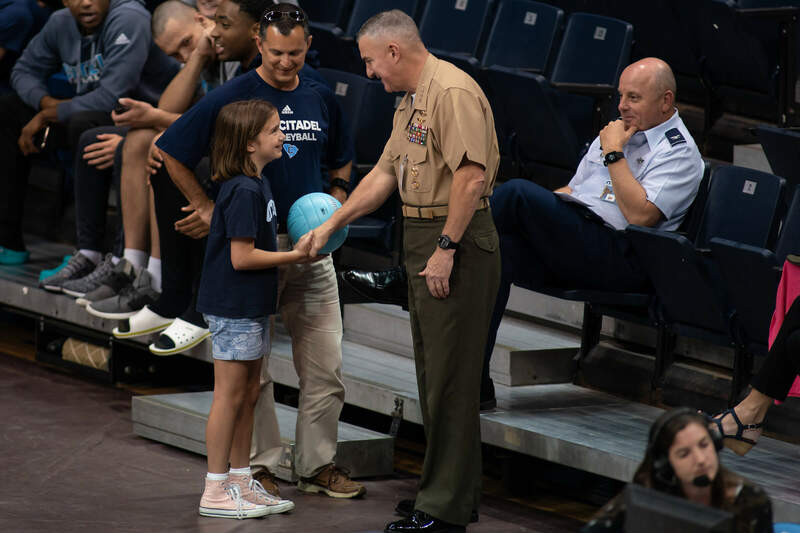 At a Bulldog volleyball game on November 10, 2018, the daughter of CDR Kevin Borden, TAC officer, asked General Walters to sign her volleyball. 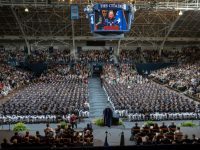 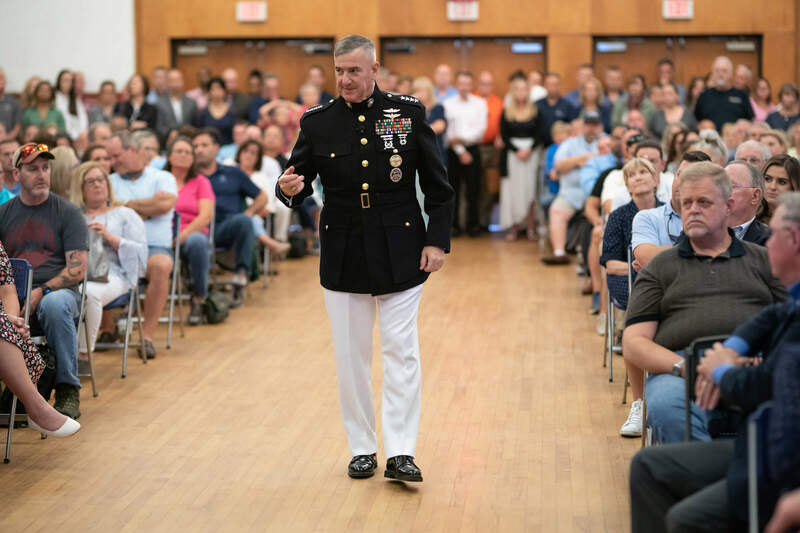 General Walters’ first public appearance as President of The Citadel was an address he delivered to parents visiting for Parents Weekend on October 12, 2018. 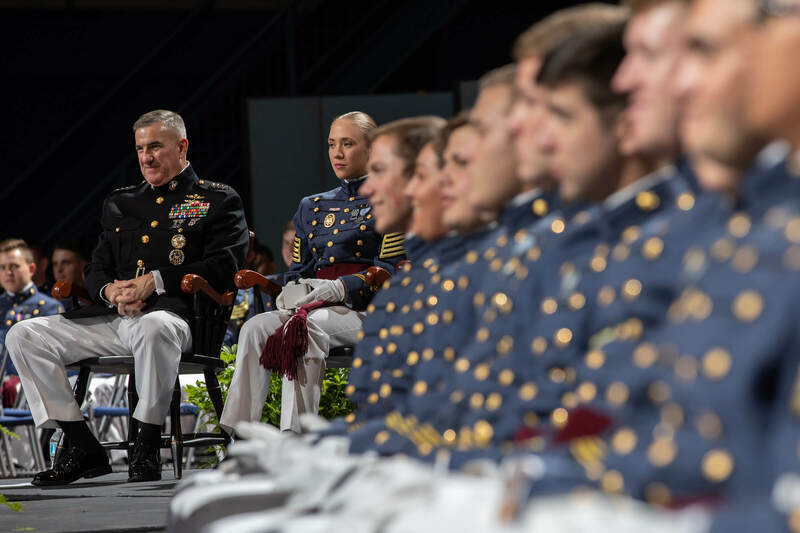 General Walters sits with Cadet Colonel Sarah Zorn, Regimental Commander, during the Ring Presentation for the Class of 2019 on October 12, 2018. 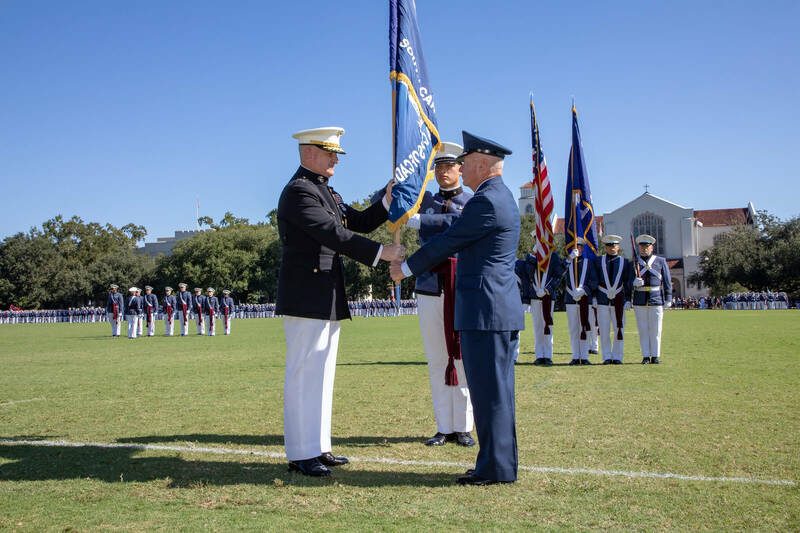 General Walters accepted the flag of the South Carolina Corps of Cadets from outgoing interim President, Lt. Gen. John B. Sams Jr., during a change of command ceremony on Oct. 8, 2018, signifying the beginning of his service as the 20th president of The Citadel. 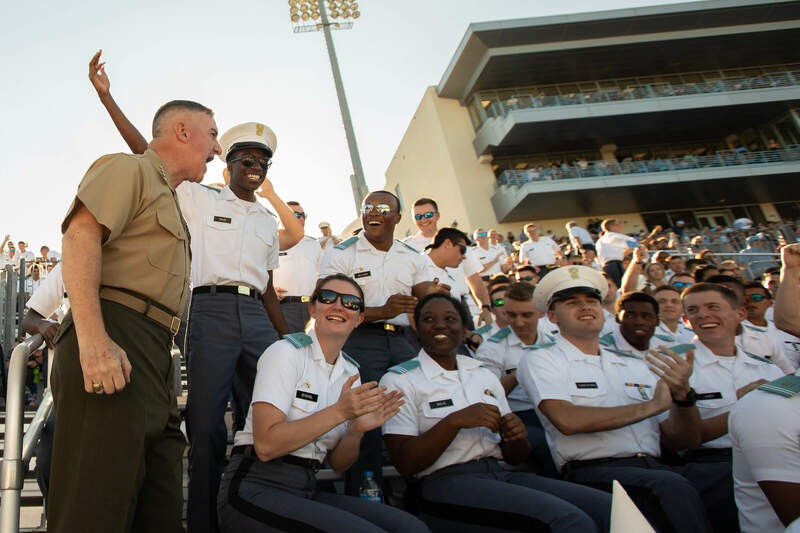 A Bulldog through and through, General Walters led the cadets’ chants at his first home game since becoming president when the Bulldogs played ETSU on October 13, 2018. 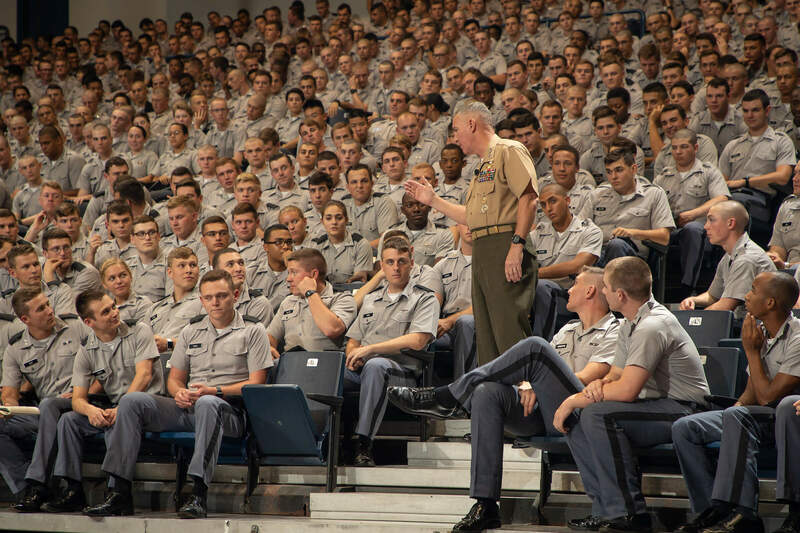 During his first address to the South Carolina Corps of Cadets on October 16, 2018, General Walters reminded cadets of the significance of the uniform they wear every day. 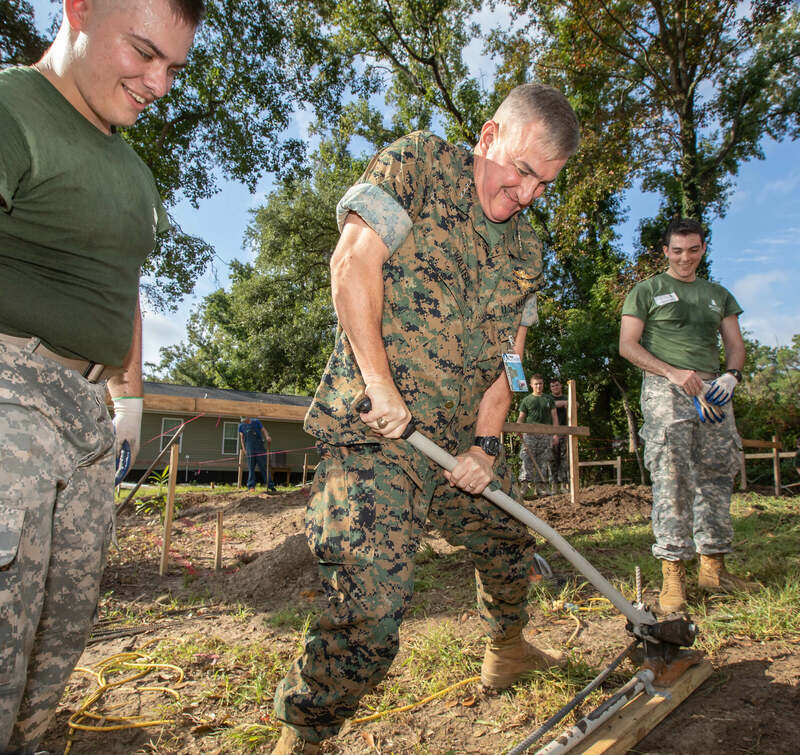 General Glenn Walters bends a piece of rebar used for a construction project at Sea Island Habitat for Humanity during The Citadel’s annual Leadership Day activities on October 17, 2018. 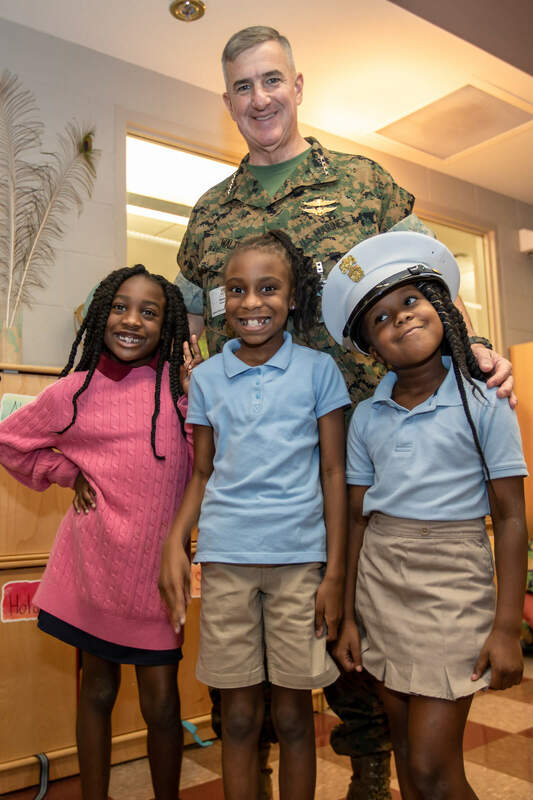 General Glenn Walters poses for a picture with Tahlayjah Butler, 2nd grade; Airriona Scriven, 2nd grade; and Shanese Holmes, 3rd grade; at James Simons Elementary School during The Citadel’s annual Leadership Day activities on October 17, 2018. 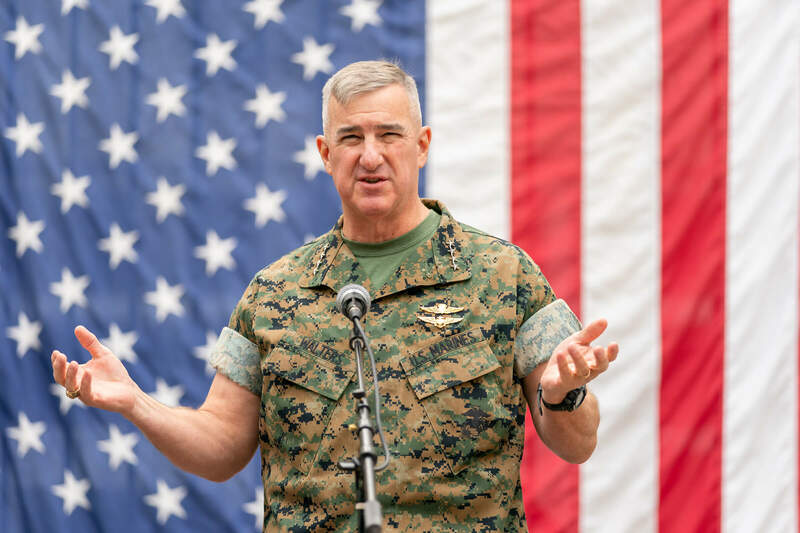 General Walters speaks at a tailgate celebrating the 50th anniversary of The Citadel Graduate College on October 27, 2018. 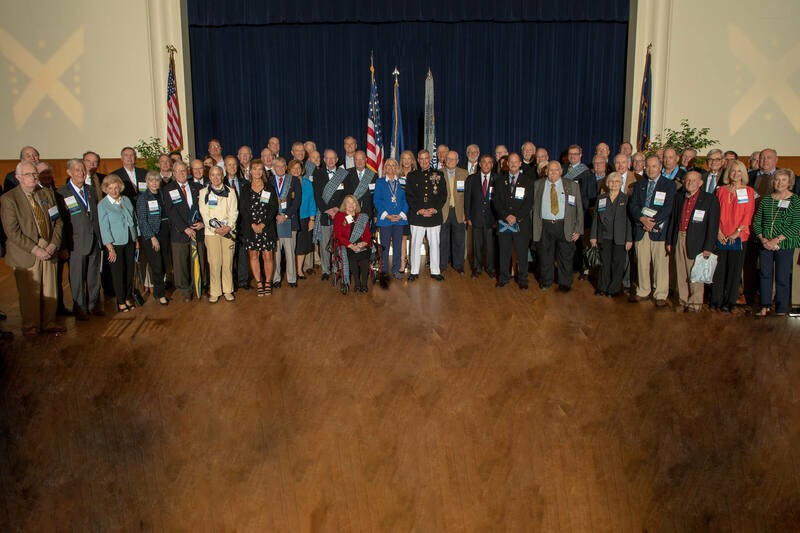 General Glenn Walters stands with the Leaders in Philanthropy during a celebration honoring their generosity on October 30, 2018. 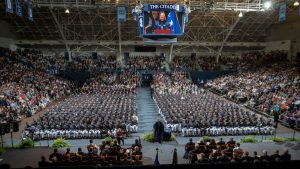 The General values the passion and generosity of our alumni and friends. 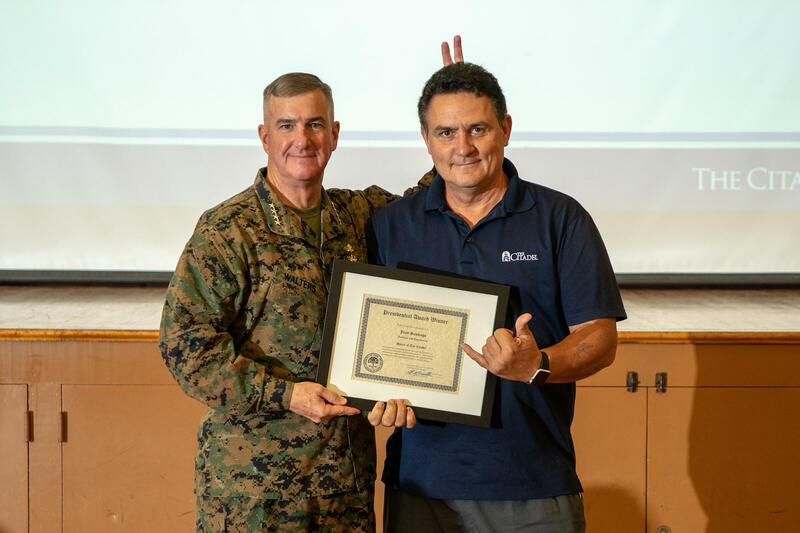 During his first presidential town hall for employees on November 8, 2018, General Walters had a little fun with Juan Santiago, recipient of the Fall 2018 Spirit of The Citadel Award. 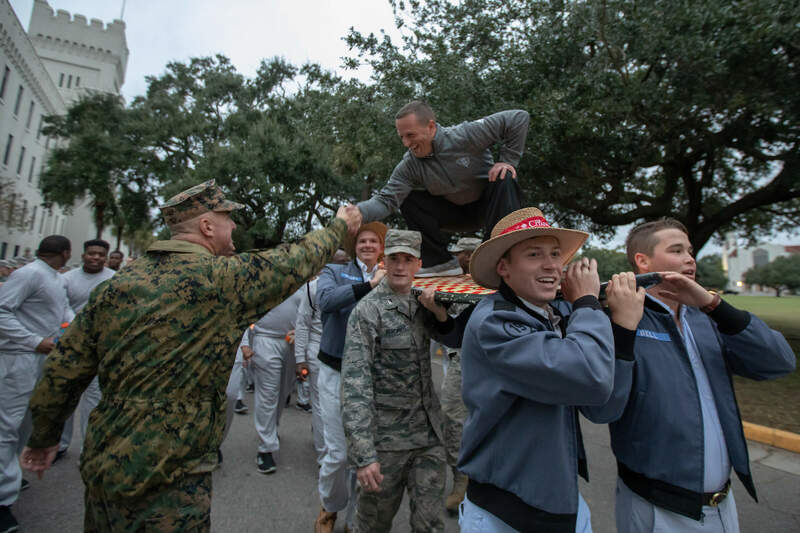 General Walters sent off Coach Brent Thompson and The Citadel Bulldogs as they departed from The Citadel’s campus on November 15, 2018, for Tuscaloosa, Alabama to take on the Crimson Tide. 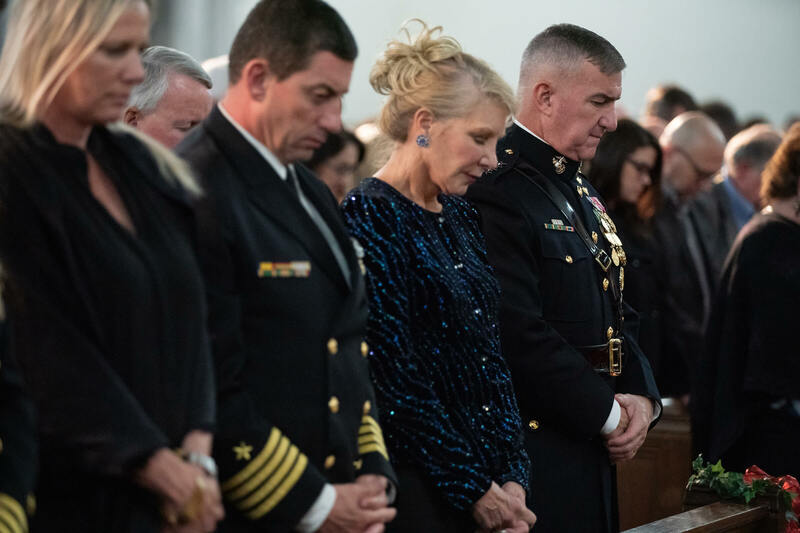 General Glenn Walters and first lady Gail Walters paused for a moment of prayer during The Citadel’s 81st annual Christmas Candlelight Services on November 30, 2018. 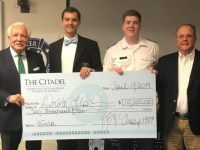 General Glenn Walters sits with Paul Bowers and Robert Behre of the Charleston Post & Courier to outline his vision for The Citadel’s future. 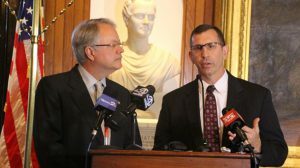 The resulting article was released on January 1, 2019.